Painting kids rooms calls for a little fun, a touch of fantasy, and a lot of sweetness. Sweet Fondant Cakes are fantasy rolled into food. I recently became inspired by these whimsical cakes when my design school cohort from Hawaii told me she was creating these incredible delights! I personally can't justify making the cakes since they're quite a departure from how I eat. 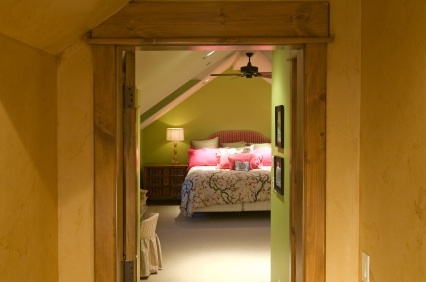 I would, however, consider borrowing their whimsy and color when designing a room for a child! 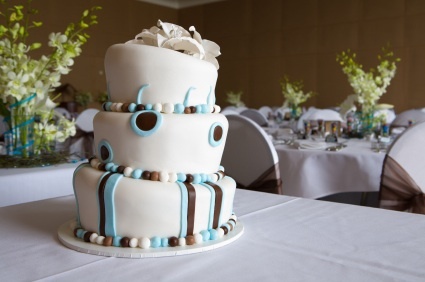 It's a way to enjoy the fondant cake experience without the calories! Now is that really cheating? Colorful fondant cakes are essentially multi-tiered cakes in a play-dough-like wrapping. Why not design your kids rooms in the same way, just by mixing and layering colors, limited only by your imagination. Take a look at a picture of a fondant cake and parlay that creativity into your own kids room design. 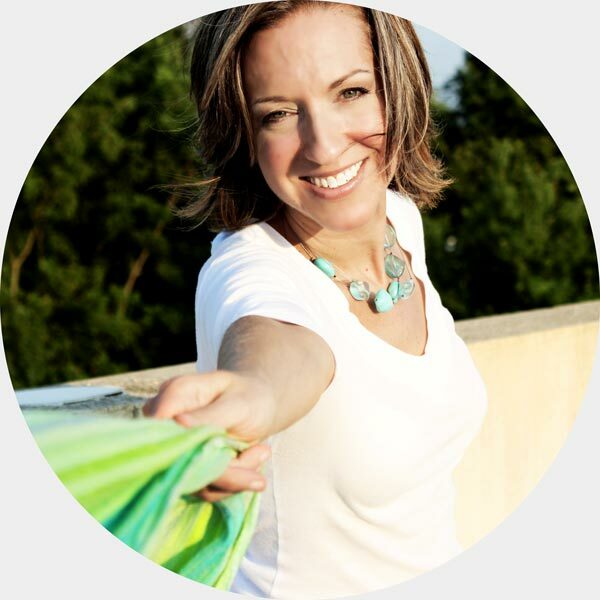 Try fun color schemes like lavender & green, pink & teal, or celery, sky blue and red. Kids will love it if you drizzle fun designs on their walls. Polka dots and stripes add layers of color to a room. 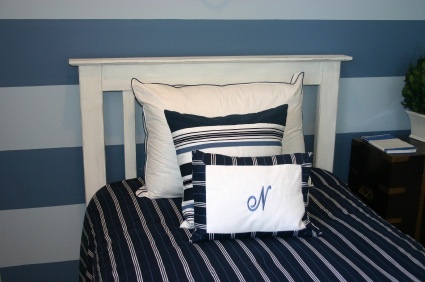 Painting each piece of furniture creates another layer of fondant fantasy in kids bedroom themes. Use accent colors to spread fun and color throughout their room. Now here's a site where you can borrow some great color schemes! And get a few ides about Kids Parties and Entertaining while you're at it! I give credit to Martha Stewart and others for also recognizing Fondant Cakes as a good thing. Martha Stewart Paints offers up a smooth "Buttercream." Benjamin Moore serves up its Aura "Fondant." Glidden makes its own satiny "Fondant." These soft foundation shades can be used with pale blues and vibrant greens. This grouping will add subtle but sophisticated layers of color. 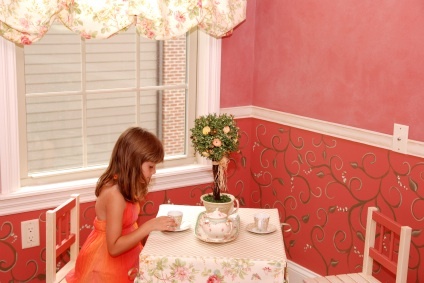 The Flower Garden is one of the easier kids bedroom themes. Benjamin Moore's "Wildflowers" or Behr's "Hollyhock" can set the atmosphere. You can easily paint whimsical flowers and stems on a wall. A few squiggly lines can create instant blades of grass. The flower theme can continue on lamp shades and picture frames. 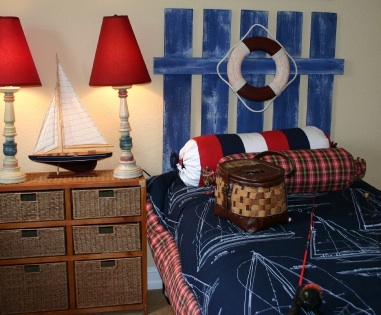 A transitional theme that is good for the growing child, guest room or vacation home is the Nautical Theme. Blues and Whites can dominate, with wood furniture in brown or weathered white. A splash of red tops off any room for fun, whimsy, and interest. And don't forget the Safari Theme! It's quite popular with boys for painting kids rooms. The Benjamin Moore Aura collection has a "Safari" paint. Its color reminds you of impressive camels. This kids bedroom theme also borrows from the jungle and uses deep greens and browns. And don't forget the animals when painting kids rooms in a safari theme! You could even try a zebra pattern on one wall. Bakers everywhere lavishly pour fondant onto delicate and elegant petit fours. Room Color Schemes builds on that theme. 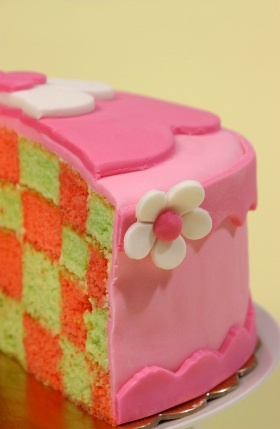 Just think of turning your kids room into a Fondant Cake. Or contact me to see how you can pour that same sweet luxury into painting kids rooms!